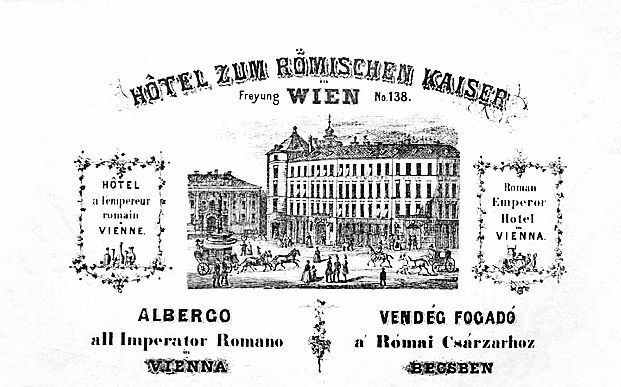 The first public performance of a secular work by Franz Schubert took place on 1 March 1818 in the hall of the inn and hotel "Zum Römischen Kaiser" at Vienna's Freyung. On Sunday, March 1st, at 5 p.m., a musical-rhetorical academy for the benefit of Mr. JÄLL took place in the hall of the Römischer Kaiser [...] The second part began with a wonderfully lovely overture by a young composer, Mr. Franz Schubert. This student of our esteemed Salieri already knows how to touch and move all hearts. Although the theme was strangely simple, an abundance of surprising and pleasant thoughts developed from it, executed with power and elegance. We wish that this artist will soon delight us again with a new offering. 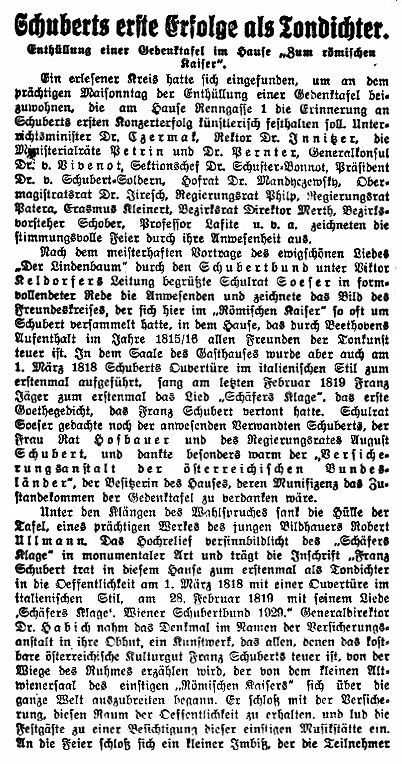 On March 12th the same overture was performed again in an arrangement for two pianos for four hands each (with the participation of the composer) after which the reviewer Franz von Schlechta praised "the deep mind and the controlled and outright force and appealing loveliness" of Schubert's works. 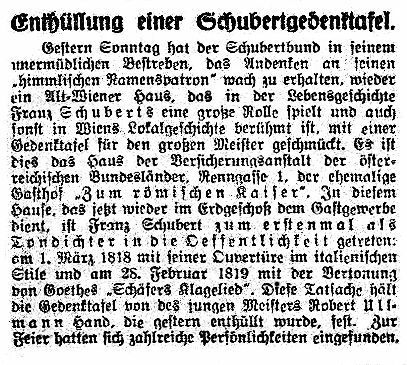 On 28 February 1819, in the hall on the first floor of the house "Zum römischen Kaiser", music history was made again, when the tenor Franz Jäger performed the song "Schäfers Klagelied" (D 121). This was the first ever public performance of a Schubert song. On March 22nd the Berlin journal Der Gesellschafter wrote about this concert: "A vocal piece »Schäfers Klage«, composed by the young Schubert and sung by our fine tenor Jäger granted the greatest enjoyment. We are indeed looking forward to the delight provided by an upcoming greater work of this hopeful artist." Five years earlier, another important musical event had taken place in the very same venue: on 11 April 1814 Beethoven's "Archduke Trio" Op. 97 had been performed for the first time. 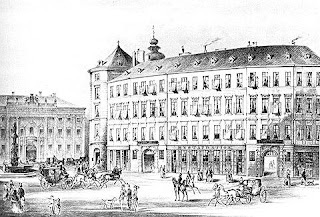 Until 1887 the house on the Freyung (today Renngasse 1), which after a remodeling in 1834 housed a luxurious hotel, was owned by the Rothschild family. Then it was sold to the Union Bank which in 1927 sold it to the insurance company Österreichische Bundesländer AG. Franz Schubert trat in diesem Hause als Tondichter zum erstenmal vor die Öffentlichkeit: Am 1. März 1818 mit einer Ouverture im italienischen Stil, am 28. 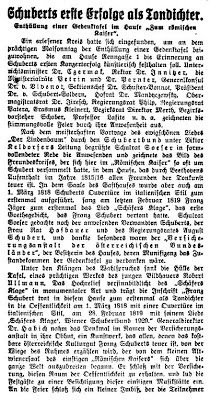 Februar 1819 mit seinem Liede »Schäfers Klagelied«. Wiener Schubertbund 1929. 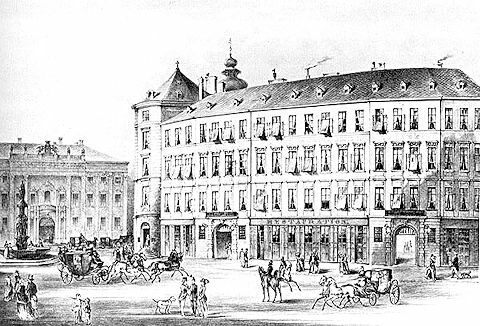 In this house Franz Schubert went public for the first time as a composer: On 1 March 1818 with an overture in the Italian style, on 28 February 1819 with his song »Schäfers Klagelied«. Wiener Schubertbund 1929. On the following day the conservative newspaper Reichspost raved: "On behalf of the insurance company its general manager Dr. Habich took charge of the monument, a work of art that will tell everybody, who holds precious the cultural heritage of Franz Schubert, about the cradle of fame that spread from the small Old-Vienna-hall of the erstwhile »Römischer Kaiser« all over the world." 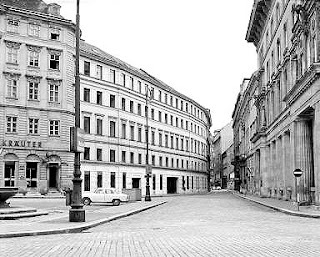 The course of history was not kind to the house Renngasse 1. During the great bombing raid on 12 March 1945 it suffered a severe hit that destroyed nearly a third of the building. A five-window section of the right wing collapsed to the level of the first floor. Although the house was restored, the original infrastructure was not preserved and the old structural core of the building has been replaced. What about the Schubert memorial at the Freyung that was supposed to tell posterity – "that holds precious the cultural heritage of Franz Schubert" – about "the cradle of fame" in times to come? The memorial is gone. In June 2003 a complete remodeling of the house was begun on behalf of Armisola Immobilien AG. The architect DI Peter Klein completely redesigned the house into a modern office building for Deloitte Austria, preserving the original façade only above the first floor. Within fourteen months of construction work the symmetry of the original façade (resembling the old Trattnerhof) was dissolved and the two old entrances were replaced by two entrances on the very left part of the building, at precisely the area where the Schubert memorial had been located. Owing to the company's plate "Deloitte" there was no space anymore for the memorial which was simply removed. The architects involved in the remodeling did not even think of integrating the sculpture, which had adorned the building for 74 years, into the new entrance area. The companies responsible for this brutal procedure are actually quite proud of their work and particularly boast about "the preservation of the original façade". In a booklet (deloitte: 15 antworten für kids), published for children by the architects, we find the following euphemistic statement: "Da gab es einen Architekten, den Herrn Klein, der hat das Haus gebaut, mit Kränen und starken Maschinen, und so raffiniert, dass aussen[sic] sogar die alte schöne Fassade stehen geblieben ist, obwohl es drinnen ein ganz modernes Haus ist." ("There was an architect, Mr. Klein, who built the house with cranes and heavy machinery in such a sophisticated way that on the outside even the old beautiful façade was preserved, although inside it is a very modern building."). It seems possible however that the addressed children might pose the question, if there really were no nicer lights available for the lighting of the "old beautiful façade". 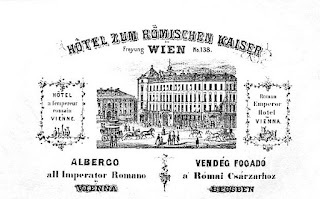 The remodeling of the building's façade and its merciless stripping of all "historical trinkets" was apparently carried out in full agreement with the City of Vienna and the Bundesdenkmalamt (the Federal Monuments Office), because the responsible building promoter A.C.C. proudly states on its website: "In enger Zusammenarbeit mit den zuständigen Behörden wurde die Fassade den Erfordernissen des Platzes und den umgebenden Gebäude angepasst." ("In close cooperation with the authorities in charge the façade has been adapted according to the requirements of the square and the surrounding buildings."). My search for the missing memorial turned out to be quite fascinating. 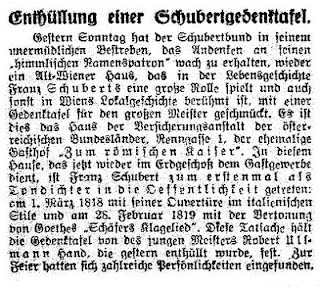 I got the first hint from the general planning manager of the reconstruction and after an on-site inspection an employee of IFM (Immobilien Facility Management) confirmed my suspicion – heavy blocks of stone rarely travel far – that the Schubert memorial is now located "in safe custody of the property management in the basement of the house". The ignorance and blindness of local Viennese historians is exemplified by Herbert Kretschmer who in the book WIEN Musikgeschichte (Vienna: LIT Verlag, 2011[!]) wrote: "Only a memorial plaque on the house, which since the late 19th century has been used as an office building, is a reminder that an important musical site was once located here." Of course, we must not always quarrel with aesthetic principles that are uncompromisingly realized by architects. And yet, unfortunately, none of the involved designers hit upon the really not far-fetched idea to integrate this sculpture into the redesigned atrium as a reminder of the fascinating history of the building. (After all this is also the house, where the physician Romeo Seligmann in 1834 first made the acquaintance of Ottilie von Goethe). The observant city resident is surprised that the Bundesdenkmalamt turned a blind eye to this procedure. 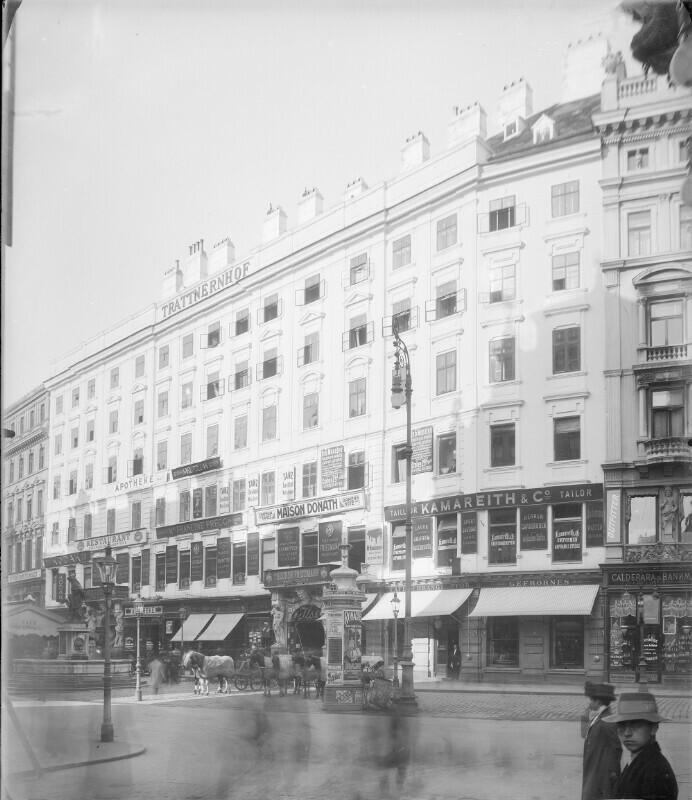 He is forced to surmise that Ursula Stenzel, the then Bezirksvorsteherin of Vienna's first district was prevented from devoting the necessary attention to a radical razing of a historical downtown façade by more important issues, such as the containment of Glühweinhütten and street artists. Should it really be true that in Vienna, the self-proclaimed "City of Culture", a monument to the greatest genius that this city has ever produced, is only an impeding piece of stone on the path of urban progress? Research in the earliest baptismal records of St. Stephen's Cathedral proves to be difficult, because of very fragmentary indexes. The Mozarteum recently issued a press release regarding "sensational discoveries" in Mozart portraiture which contains statements that are likely to mislead the public. 1) The "Boy with the Bird's Nest" (attributed to Zoffany) "does not show Mozart and is a fake". As a matter of fact that this painting does not show Mozart had been known to art historians for ages. The painting is not a fake, but a misattribution by greedy sellers and/or wishful "experts" who already existed at the Mozarteum back in 1925. 2) "The Unfinished Lange portrait had been already finished before it was enlarged which has been proven by X-ray analysis". This fact was already uncovered by me back in March 2009 without any X-ray and the recent analysis was only carried out after I had suggested this procedure to Dr. Ramsauer in June 2010. 3) "The miniature on ivory on a tobacco box definitely shows Mozart" (quote: "Nun ist es sicher"). As a matter of fact this miniature (Mozart-Museum Salzburg, Inv. Nr. 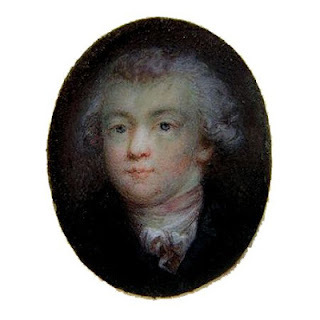 90/47) has already been identified as genuine Mozart portrait five years ago by the historian (and retired head of the Munich City Archive) Dr. Richard Bauer in his excellent book "Das rekonstruierte Antlitz" (Neustadt an der Aisch: 2008, pp. 6-11). Revaluating the sources (among others Constanze Mozart's letter to Breitkopf & Härtel from 21 July 1800 and the 1829 engraving by Christian Benjamin Gottschick) Bauer came to the conclusion that the portrait "is an en-face-portrait of Mozart dating from the mid 1780s". However (and in my opinion quite correctly) Bauer doubts the attribution to Joseph Mathias Grassi (hilariously misnamed "Joseph Maria Grassi" by the Mozarteum staffer Dr. Christoph Großpietsch), because Grassi, who was personally acquainted with Mozart, would not have written "Joh: Mozart" on the back of the painting and the execution of the portrait is starkly at odds with Grassi's elegant style. Furthermore the attribution to Grassi is only based on a very dubious 1792 engraving, listed among Mozart portraits by Constant von Wurzbach in 1868 (32. "J. v. Grassi p. 1785, Gottschick sc. 1792") that has never been verified. (Gottschick would have been 16 years of age in 1792). It is to be hoped that Bauer's 2008 identification and my 2009 discovery will be referred to by the Mozarteum in the catalogue of its upcoming exhibition. 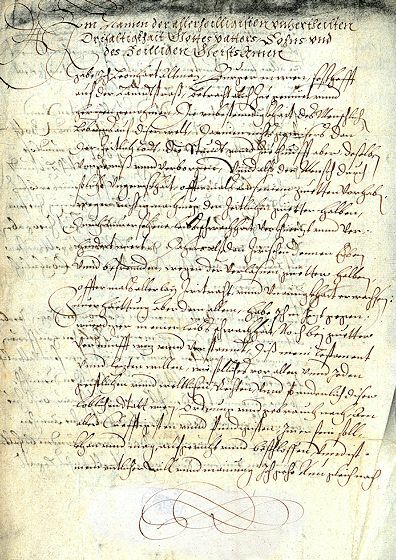 Eva Rosina Altmann's father (Mozart's great-grandfather) Dominik Altmann, Imperial sworn public notary and member of the inner council of the Imperial Cities of Krems and Stein ("Kaÿserlich geschwohrner Notarius Publicus. Wie auch beeder Kaÿserlichen Stätt Crembs und Stain des Innern Raths") was born in Vienna on 4 August 1636. His parents were the gardener ("Gartner auf der Landtstrass alhie") Jacob Altmann and his second wife Maria, née Oeller. 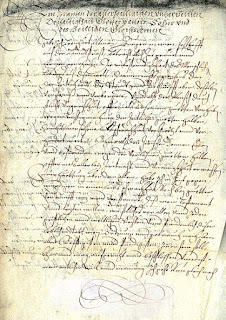 The entry concerning the baptism of Mozart's great-grandfather Dominik Altmann on 4 August 1636 at St. Stephen's Cathedral (A-Wd, Tom. 12, fol. 67r). Mathias Hundtspichler, who was also the godfather of several of Jacob Altmann's children, was a member of a whole dynasty of house owners and gardeners by that name who can be documented to have resided in the Viennese suburbs Landstraße and Erdberg between 1600 and 1800. 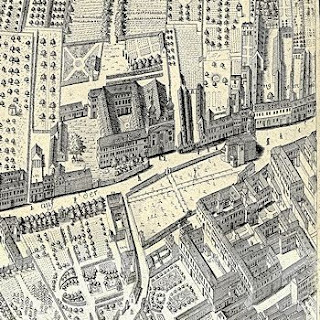 In May 1767 one of Hundtspichler's descendants, the local judge and Kuchlgartner (kitchen gardener) Anton Hundtspichler assisted Angelo Soliman's future wife Magdalena Christian with the purchase of her house in the Viennese suburb Weißgärber. The gardener Jacob Altmann died shortly before 3 March 1639 on which day his will was published. 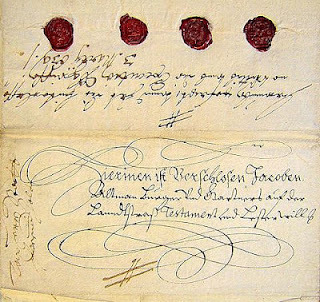 The envelope of Jacob Altmann's will, written on 4 November 1638. 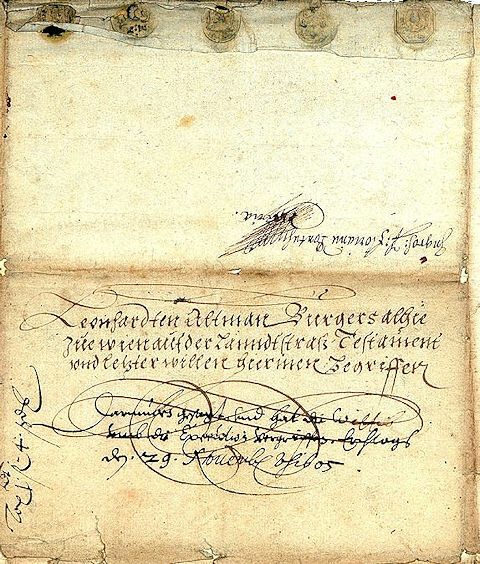 One of the seals is Mathias Hundtspichler's (A-Wsa, AZJ, 3822/17. Jhdt.). When more than 40 years ago Heinz Schöny did genealogical research on Mozart's Viennese ancestors, he mostly dealt with Mozart's great-grandfather Dominik Altmann and his ten children. He identified Dominik's parents, but did not cover the preceding generation. This was probably caused by the scarcity of surviving biographical sources concerning citizens who lived in Vienna at the end of the sixteenth century. 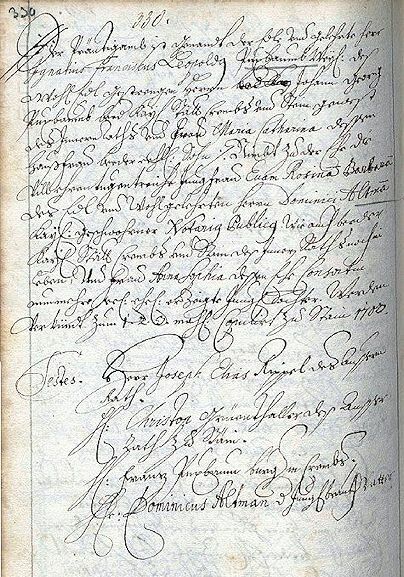 The surviving death records of the Vienna Magistrate only start in 1648 and the oldest Viennese baptismal records (which only cover relatively small areas of the city) only reach back to 1585, while burial records do not even go back into the sixteenth century. Progress of research can only be achieved with a time-consuming systematic search in all the surviving archival holdings, an enterprise that Schöny obviously was not in a position to carry out. In early 2012 I was able to add one male ancestor to Mozart's family tree by identifying Jacob Altmann's previously unknown father as Leonhard Altmann, "Bürger alhie zue wien auf der Lanndtstraß" ("citizen here in Vienna on the Landstraße"). Owing to the limited number of sources his identity could only be ascertained by his will which was written on 22 August 1605 and published on 29 November of the same year. No document survives that provides information as to his age at the time of his death or the date of his wedding. 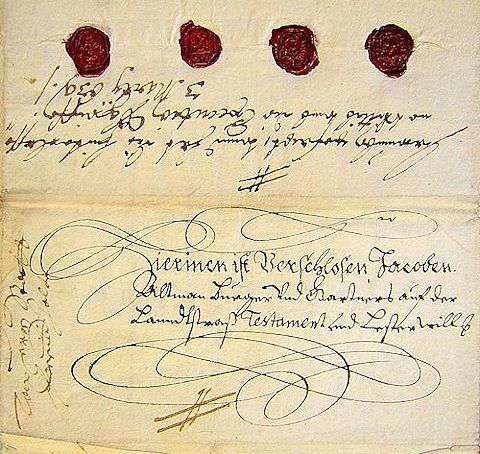 The envelope of the will of Mozart's great-great-great-grandfather Leonhard Altmann who died in November 1605 (A-Wsa, AZJ, 520/17. Jhdt.). Und alßdann verschaffe ich meinem Eheleiblichen Sohn, Jacoben Altman, So Ich bei jeziger meiner Ehelichen Hausfrauen Anngneß Im ehelichen standt erzeügt, füer sein Vätterlich Erbguett, In Bahren geltt ainhundert gulden Reinisch. Solche Ainhundert gulden soll mein Hausfrau, biß zue berüerts unnsers Sohnes Vogtbarkeit, ohne Ainichen Inntrese bei Iren Hannden behalten dennselben unnsern Sohn ohne entgelt solches Legats biß zu seinen Vogbahren Jaren od[er] daß ehr sein Nahrung selbst gewinnen mag, mit aller Menschlichen nottüerft versorgen und Christlich auferzihen, Im fall es sich aber nach dem willen gottes begäb, das mehrberüerter unnser Sohn Jacob, vor seiner Muetter, ungevogt mit Todt abgienng, So soll berüerts legadt der ainhundert gulden, auf mein Hausfrau freÿ ledig fallen, Und darvon solle sie meinen negsten befreünden, mehrers nit, dan füenf Pfundt, und Sechzig Pfening hinaus zuegeben schuldig sein, damit sollen sie meine befreünden alerdings hindan und abgefertigt sein. Item meinen Zwaÿen Stieftöchtern, Barbara und Maria, verschaffe Ich auß guetten freÿen willen ainer jeden absonnderlich Zwainzig Gulden Reinisch thuet sambentlich vierzig gulden, Solches legadt soll Ebenfals, mein Hausfrau ohne Intrese, biß zu jedweder Vogtbahrkeit bei Iren Hannden behalten, Und wen Unnder disen meinen Stieftöchtern aine vor der andern Ungevogt mit Todt abgiennge, so soll der Abgestorbnen Legadt, auf die überlebent under ihnnen fallen, gienngen sie aber Beede vor obgedachtem meinem Sohn Jacoben Altman, Ungevogt mit Todt ab, So soll solches legadt alleß und jedes, auf ihn oftgedachten meinen Sohn freÿ ledig fallen. Furthermore I bequeath to my legitimate son Jacob Altman, whom I begot in marriage with my current wife Agnes, as paternal bequest one hundred Rhenish florins in cash. These one hundred florins should be held in trust by my wife without interest of her own until our aforesaid son reaches legal age. Without any compensation from this legacy she should also take care of our son and all his human needs and raise him in a Christian manner until he reaches majority or is capable of supporting himself. If however it should be God's will that our aforementioned son Jacob should die a minor before his mother, the aforesaid bequest should freely be passed to my wife. And from this she should be obliged to give to my closest friends five Pounds and sixty Pfennigs, but not more. Therewith my friends however should be satisfied. Likewise to each of my two stepdaughters Barbara and Maria out of good and free will I bequeath twenty Rhenish florins, forty florins in all. This bequest should also be held in trust by my wife without interest until both of them reach legal age. And if one of my stepdaughters should die a minor before the other, the bequest of the deceased should go to the surviving one. If however both of them should die under legal age before my aforementioned son Jacob Altman, all of the bequest should freely go to my aforesaid son. One of the four witnesses to Leonhard Altmann's will was "der Ehrsambe und füerneme Matheß Hundtspüchler der Zeit Richter auf der Landstraß" ("the honorable and noble Mathias Hundtspüchler, current judge on the Landstraße"), who either was identical with Jacob Altmann's best friend, or, more likely (since a "Mathes Hundßpüller der jüngere[!]" from the Landstraße got married in 1608), the father of Mathias Hundtspichler who was to play an important role in the life of the next generation of the Altmann family. 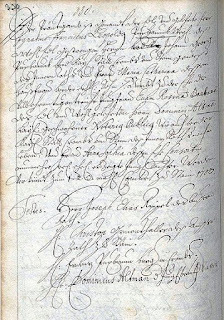 Another one of Leonhard Altmann's witnesses was Georg Wagner who in 1633 was to serve as best man at Jacob Altmann's wedding. Mozart's great-great-great-grandfather Leonhard Altmann was buried in the old St. Nikolai cemetery on the Landstraße (which was disbanded in 1784). This discovery was first reported in print in the Newsletter of the Mozart Society of America, Vol. XVI, No. 1 (27 January 2012). © Dr. Michael Lorenz. All rights reserved.